With magnanimous offers like free data and free calls Reliance Jio has garnered the support of over 100 million subscribers. Now it has the opportunity to gather more with its latest introductory offer of Rupees 99 Prime Member for data, while voice calls are still free. It’s a sign that Reliance Jio is set to start making revenue. Click here to know everything about Jio Prime Membership program. These plans will start from April 2017 after the Happy New Year offer ends on March 2017. The Jio plan after March 31 will cost you just Rs 309, with which you will be able to enjoy 1GB of 4G internet data daily and all other free services like unlimited voice calling, SMS, and access to premium apps. So if you’re wondering about how you’re supposed to avail this offer, all you need to do subscribe to Jio Prime membership from MyJio app. After you become a Jio prime member you’ll be able to recharge your Jio Number with Rs 309 every month to enjoy all the free services. Rs.309/- monthly charges for unlimited voice & other services with 1GB high-speed data & post the data usage speed will reduce to 128kbps. 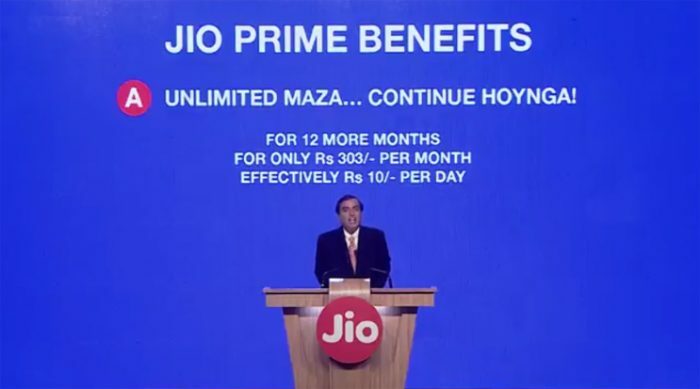 Reliance Jio users would be familiar with the Welcome Plan which was introduced in the 5th of September in 2016 and would continue shelling out freebies till the 31st of December 2016. Giving users unlimited 4G data, voice calls and SMS’s on any network. On the 2017 new year’s however, Reliance released its Happy New Year Plan which came into effect on the 1st of January extending similar benefits (but now only free 1GB of 4G data) till the 31st March ’17. The Reliance Jio Happy New Year offer has now been extended until 31st March 2018 as Jio Prime membership offer. But why is Reliance charging even 99 Rs? Reliance has a fear of losing customers after March ’17 due to extended charges. This plan is pocket-friendly enough to gather a loyal following. Reliance is trying to bridge the gap between rural and urban India and promises to shape the future with end-to-end solutions. Let’s hope Jio lives up to its expectations. Note: This information is officially announced today by Sir Mukesh Ambani. Please mention the validity of the plan. Is the 1GB data valid only for one month or is it like the Happy new year plan 1GB for a day. And Do we have to recharge for every month or once recharge is valid for 90 days ? Be specific. I think the blogger made it clear already i.e. INR 303 per month for 1GB 4G-data/day for 30days. U also get all the free calling and sms services inclusive in that recharge. Only that u have to become a prime member. Yes you can use unlimited 4G data between 2 am to 5 am. Thanks for this extended new most economical nd picket friendly as well as customers’ friendly offer. Hats off to Reliance Jio.rgds. c l narula. The June 30 Extended Plan, of 1GB 4G. Is it 1GB per day or for whole 90 days??? Good news for Jio users, it gives users to continue Jio services. That is too much per month 303.because only this company declared 149 to unlimited all voice data and other. Will the new plan June 2017 be 1 GB data per day? With recharge of Rs 100 for 3 months or every month we need to do recharge for Rs 100. Please clarify. Rs99 is just for the membership of a prime member. After becoming a prime member, u have to pay Rs303 every month to avail the internet services and all other services. So first u need to become the prime member then only u can pay Rs 303. If u don’t pay rs 99 for membership, u wud still get calling free. After the one time Rs.99, you must have to pay Rs303 monthly to enjoy the same services. Thank you for extending the offer upto 30june 2017 at a nominal cost of Rs 100 for three months. I assume that one GB limit is on per day basis upto 30th june 2017. Is there any last date for charging with Rs 100. God will bless Jio company! What will be the validity. and how much data Will we get for rupees 100.? It takes recharge of 303/- per month for 1gb of 4g data per day. Unbelievable offer.Thanks Jio for extending low price internet. Is it Rs 100 for 1 GB of data? To avail the current facility up to June 2017, when should one recharge from Rs.100/- and is this recharge for one time or otherwise. Unlimited calling for one year for INR 99 is just awesome.Kudos JIO,but those who don’t need 1gb/day,INR 303 is surely going to create issues.Smaller data pack with smaller values must be introduced to retain maximum customers. Do i need to topup with 303 to use voice and sms. 2. 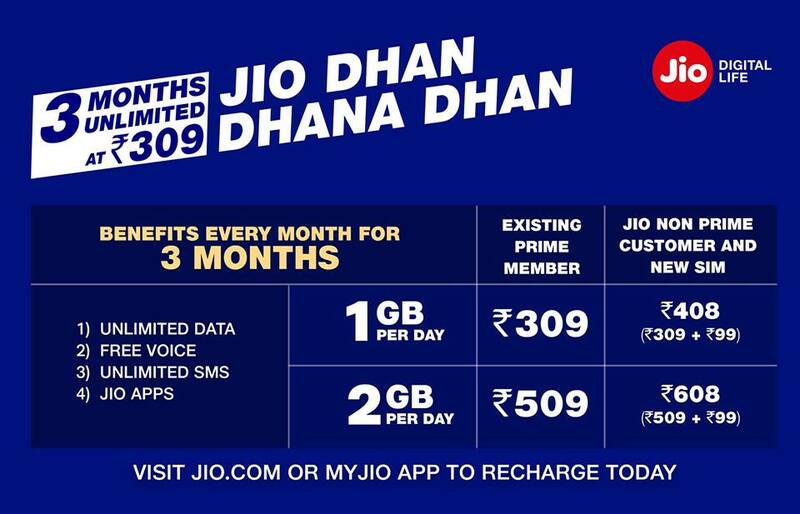 303/ per month for the same plan JIO is giving now ( Free calling & 1 GB a day of 4G data) from 1st April. So far there are no other plans? So 303/- a month or no JIO? dear sir, plase says to me if rs 303 who many data use in one day. After registering for Prime membership by paying 99/- , can I pay Rs. 303 pm for 12 months in advance, as I will out of India for 4 months, I will not be able to pay every month. I do not want to miss this plan. Thanks jio for a attracting N charming offer. Signal is very low please provide high signal and jio offer is very good. thanks mukesh to stop monopoly of all operators we suffer a lot but now acche din agye . thanks . we all with you mukesh ji. the loss bear by company will recover within 6 month but please don’t cheat us like other operators. Your 4G internet is very use full in teaching Science and Mathematics. My profession is school teacher, suggested my relatives and friends to get jio offers. I enjoyed lot by happy new year scheme. But, it is difficult to re charge monthly such a huge amount. Please reduce the amount. It will be help full for millions of people. may I shift to the other company network. Any how, you cant get for 303/= unlimited talk and data. So i think this one may be better.. First we pay 99/= and try first month for 303/=. if some other competitors give more than these, we may shift to some one other network.